San Francisco:Nicholas and Perenelle Flamel have one day left to live, and one job left to do. They must defend San Francisco. The monsters gathered on Alcatraz Island have been released and are heading toward the city. If they are not stopped, they will destroy everyone and everything in their path. I think the last time I’ve been so affected by a series ending was for Deathly Hallows, book 7 of J.K Rowling’s Harry Potter series. And just like that I’ve shed tears and mourned for some of Micheal Scott’s characters. What started as a juvenile adventure turned into a story that inspires honor and courage for both young and old fortunate enough to have picked up this series. 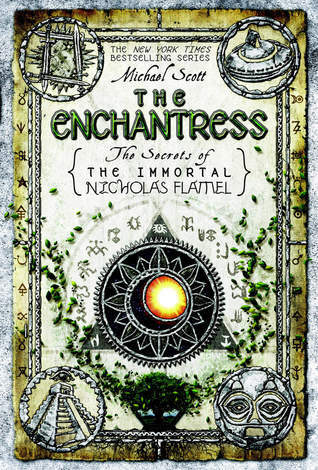 There are so many great things that happened in THE ENCHANTRESS but I want to start with how MScott ended it. In summary, the beginning is also an ending and the way he wove those two timelines together was masterful and left no space for plot holes and other nuances that usually ruins a good ending. It all made sense in the end and all this time, the story was one big beautiful cycle like an orobourus, the head eating its own tail. The light faded from his [Odin] eye. He turned to look at Hel and saw her as she had one been tall, elegant and very, very beautiful, with eyes the color of a morning sky and hair like storm clouds. “It has been an honor to fight alongside you today,” Mars said. ‘It is an honor to die in your company,” Odin [replied]. The deaths were honorable and any warrior or soldier would’ve been proud to have fought with such brave and valiant people, human or Elder. Everyone finally understood the important role they play in the greater scheme of things and in the end it was their love for humanity that prevailed. Every battle as important as the last and their combined efforts won the world back from the Earthlords. Nobody is anybody’s servant anymore, each one made a decision to stand for themselves and fight for what’s right, their old squabbles forgotten and now seem minute as the end is looming near. The ones that touched me the most was Abraham the Mage’s farewell to Tsagaglalal; Odin and Hel's sacrifice and Mars’ last war cry. There was so much about each and every character MScott created that we discover in THE ENCHANTRESS I ended up admiring some of those who I used to dislike (like Vriginia Dare) and to paraphrase Mars, he did say that man is inherently good… well most of us anyway. Come taste the aura of Mars Ultor, who was also Ares and Nergal and a dozen other names besides. But before I was Nergal, I was Huizilolopochtli, I was the Champion of Humankind. It is the name I have always been proudest of. Like so many other epic endings, there was justice and redemption in the end and though things might not have turned out exactly as we wanted it to be, it was beyond amazing nonetheless. Only a master story teller can write something so vivid that the book or series starts to have a heart and you find yours beating alongside its rhythm. I hope this will not be the last epic series MScott creates, I’ve developed a taste for his imagination and writing my only resort is to come back for more. I started this series a long long time ago. Like before I was really into reading. I think I had only read Harry Potter or something. Anyways I just couldn't get into it. So tell me you know me well enough should I try again? Kole has said this is one of his favorite series ever as well. I really need to read the rest of it, only book 1 so far for me. Great review!! I love a book that brings real emotions out of me.